February has been interesting as far as life achievements go. Well, maybe interesting is the wrong word to describe it. It was a sort of lopsided month, but for once this also doesn’t disappoint me all that much. Unfortunately I only read one & half books this month. I wrapped up Light it, Shoot it, Retouch it finally and while I think it was very informative, it wasn’t as useful to me as I’d hoped it’d be. I use different editing software so basically everything I read on that was useless to me and while I have equipment, I don’t have nearly as much as I’d need to completely recreate the book’s shots. Still, I think it will come in handy later down the road, the further into this photography thing I get. I also read Brenna Yovanoff’s Paper Valentine. You can click that title to see my review. I can hardly contain my excitement where writing is concerned these days. First, I posted a short story for Valentine’s Day. If you missed it, click HERE to read In Pursuit of Jenna Mae. Second, you may remember me saying I’d be participating in GRAPEMO this month and that my goal was to add 5K to Dreamsters. Well, not only did I meet that goal, I tripled it. It has been too long since I’ve had such a successful writing month and I can’t really even explain how excited it makes me that Dreamsters has grown from this baby of a project to a meaty 19K thing now. In addition to working on Dreamsters, I started a short story for St. Patrick’s day that I’m not really sure I’ll finish in time now, but we’ll see. So that was my month. For as fast as it moved, it wasn’t all that bad. How about your February? P.S. Reminder: If you are looking for February music, click HERE! 10 Responses to "February: In Review"
Hi! Firstly, thanks for stopping by A Nudge and for the lovely comment. I’ve been meaning to check out Diana Peterfreud’s books. I’m also looking forward to reading Paper Valentine. I really love Brenna Yovanoff’s style, so I’d probably read anything she writes. 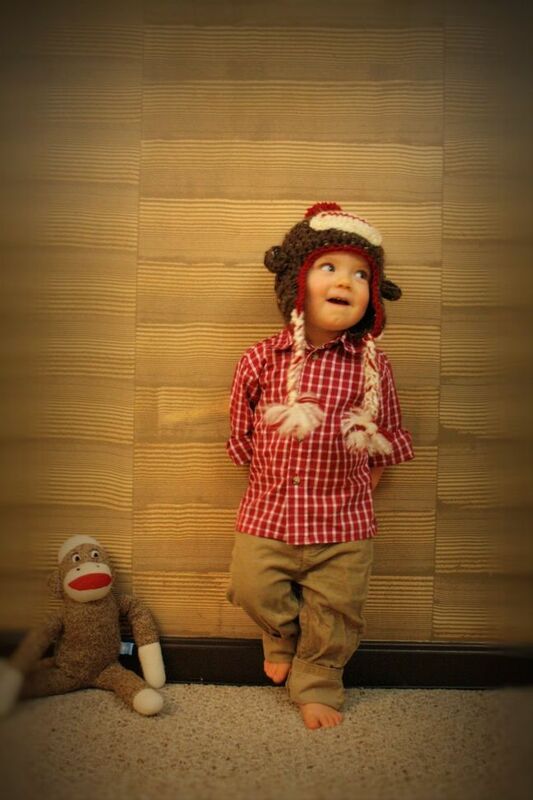 Your nephew is ADORABLE and I loooove that sock monkey hat. It is the CUTEST. Congrats on owning your word count goal! No problem! My friend Akoss tweeted about unicorns and I just couldn’t resist. 😉 Thank YOU for stopping by my blog. Very few people reciprocate these days so I really appreciate it. I’m the same way with Brenna’s work, though admittedly this book felt different than her others (not in a bad way). I hope you like Diana’s work whenever you give it a shot! 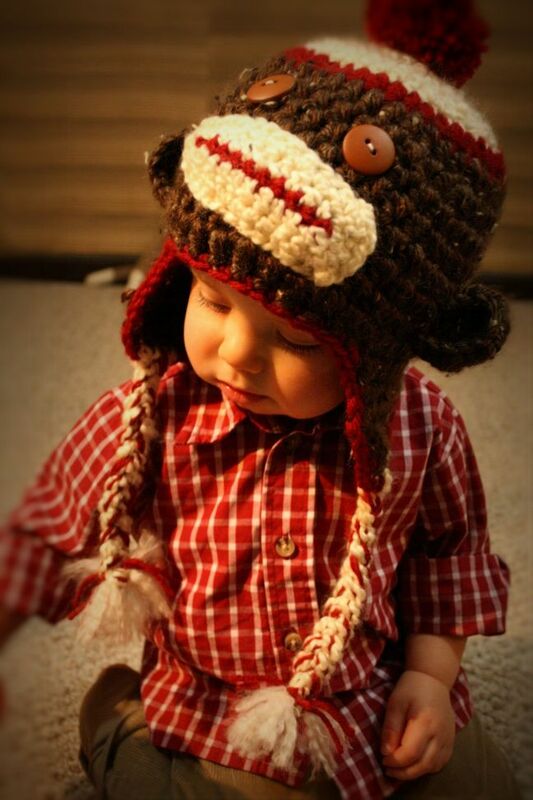 Thank you for your compliments on my nephew and my sister’s crocheting. I always feel sort of biased so it’s nice when others agree. Also, thanks for the congrats on the word count. I’m still riding an accomplishment high! 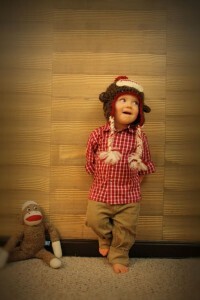 Also, Gideon is so adorable, as always! 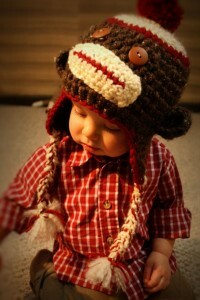 That Sock Monkey hat of his is just too cute. I’m amazed that your sister made that. She has so much talent! Akoss and I decided yesterday that TBR piles are just out of control by nature so it’s understandable to be SO BEHIND on it. I think of all of Brenna’s books you’ll like The Space Between the best, though. It’s my personal favorite. Thanks for the congrats on my Grapemo success and for cheering me on during it! It really helps having a support system. And, my sister amazes me, too. I should do an updated post of all her latest creations – they’ll blow your mind. Also, Gideon… so cute. I hope if she has another kid, they’re equally as cute or I’ll feel terribly guilty. Ha! Thanks again for joining me in GRAPEMO! 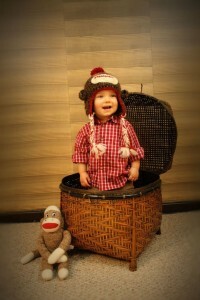 And I love that monkey hat. I would totally wear it! Thank YOU for hosting it! It was such a big help for me! And you wouldn’t be the first adult to wear one of the funner hats. An adult recently ordered THIS from my sister for themselves. Terribly cute. LOL, I agree! If I wore it, would it make me…wiser??? I only achieved half of mine but I’m still glad I got something done. Your sister is sooooooo talented. I can only dream of being able to do things like that. Half is more than none! I’m really glad you participated, I hope you can continue finding time to work on your WIP! And, yeah, she amazes me. It was her resolution to learn crocheting last year since it’s something my great grandmother did. Her goal was to make an afghan. After that was complete she just got creative and now her stuff is leaps and bounds more impressive. This year she’s giving quilting a shot, but it takes longer so I doubt she’ll stick to it.